Barstow is a major transportation center for the Inland Empire. Several major highways including Interstate 15, Interstate 40, California State Route 58, and U.S. Route 66 converge in the city. 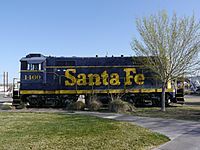 It is the site of a large rail classification yard, belonging to the BNSF Railway. The Union Pacific Railroad also runs through town using trackage rights on BNSF's main line to Daggett 10 miles (16 km) east, from where it heads to Salt Lake City and the BNSF heads to Chicago. Barstow is about 62 miles (100 km) from Baker, California and 111 miles (179 km) from Primm, Nevada. Barstow is almost exactly midway between Los Angeles, California (130 miles (210 km) southwest) and Las Vegas, Nevada (125 miles (201 km) northeast). Indian troubles with the Paiute, Mojave and Chemehuevi tribes followed and from 1860 Camp Cady, a U.S. Army post 20 miles (32 km) east of Barstow, was occupied sporadically until 1864, then permanently, by soldiers occupying other posts on the Mojave Road or patrolling in the region until 1871. Trading posts were established at Grapevines and Fish Ponds that supplied travelers on the roads and increasingly the miners that came into the Mohave Desert after the end of hostilities with the native people. 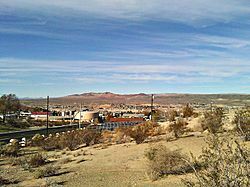 The 2010 United States Census reported that Barstow had a population of 22,639. The population density was 546.9 people per square mile (211.2/km²). The racial makeup of Barstow was 11,840 (52.3%) White (34.2% Non-Hispanic White), 3,313 (14.6%) African American, 477 (2.1%) Native American, 723 (3.2%) Asian, 278 (1.2%) Pacific Islander, 4,242 (18.7%) from other races, and 1,766 (7.8%) from two or more races. Hispanic or Latino of any race were 9,700 persons (42.8%). The population was spread out with 6,739 people (29.8%) under the age of 18, 2,481 people (11.0%) aged 18 to 24, 5,723 people (25.3%) aged 25 to 44, 5,277 people (23.3%) aged 45 to 64, and 2,419 people (10.7%) who were 65 years of age or older. The median age was 31.1 years. For every 100 females there were 99.6 males. For every 100 females age 18 and over, there were 94.9 males. In the city, the population was spread out with 30.8% under the age of 18, 10.4% from 18 to 24, 27.4% from 25 to 44, 19.3% from 45 to 64, and 12.1% who were 65 years of age or older. The median age was 32 years. For every 100 females there were 99.6 males. For every 100 females age 18 and over, there were 97.1 males. Opened in 1975 and operating 365 days a year, Barstow Station serves 20,000 tour buses a year and is a popular stop for travelers on Interstate 15. The site includes a number of gift shops, an ice cream parlour, a Panda Express, Popeyes Louisiana Kitchen, KHWY radio station and a Greyhound ticket terminal. In November 2013, Dunkin' Donuts opened inside Barstow Station, becoming only the second location of that chain within the entire state of California (following a shop on Camp Pendleton) and the first to be accessible to the general public. The McDonald's restaurant at Barstow Station consists of three side-by-side railroad cars—a reference to Barstow's railroad heritage. In September 1986, the restaurant was destroyed by fire when a customer's car burst into flames at the drive-up window. In June 1997, the re-built restaurant received national attention when a gunman opened fire during a botched robbery, injuring several people and killing a nine-year-old girl. The gunman was mortally wounded by an off-duty police officer after the ensuing gun battle and later died in hospital. Other casual dining options include: In-N-Out Burger, Starbucks, IHOP, Denny's and Jack in the Box. The oldest still operating franchise of Del Taco restaurant can be found at 401 N. First Street. Other privately owned restaurants provide Italian, American and Mexican cuisine. The town has an enclosed shopping mall, Barstow Mall, built in the 1970s. It was renovated in 2010 and is attracting new tenants, including the County of San Bernardino's new social service office for the Transition Assistance Department and Children and Family Services. The United States Armed Forces's National Training Center (NTC) and NASA's Goldstone Deep Space Communications Complex are located at the nearby Fort Irwin, north of Barstow. The Goldstone Complex includes the Pioneer Deep Space Station, which has been designated a U.S. National Historic Landmark. Rainbow Basin is an Area of Critical Environmental Concern due to landscape features and paleontological resources in the area. Located 8 miles (13 km) north of Barstow, its diverse landscape, multi-colored rock formations and scenic canyons are popular with photographers, hikers and campers keen to experience the area's natural beauty. The fossiliferous Barstow Formation (Miocene) is well exposed there. Rainbow Basin is managed by the Bureau of Land Management's Barstow Field Office. 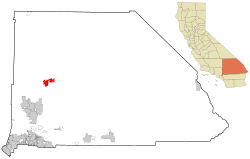 Barstow, California Facts for Kids. Kiddle Encyclopedia.